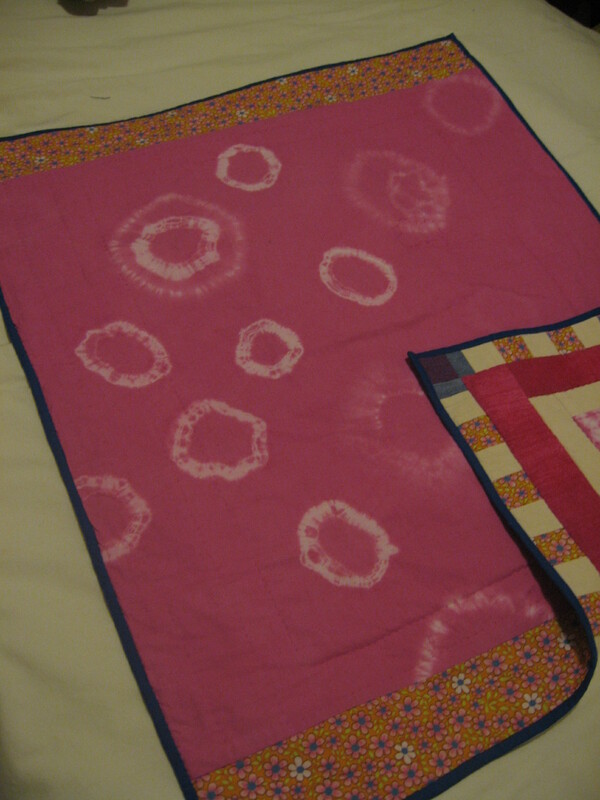 My favourite ‘make’ of this week was not cooking at all, but sewing. My foray into the world of patchwork and quilting has yet to proceed any further than cot quilts, but I’m quite proud of this result. 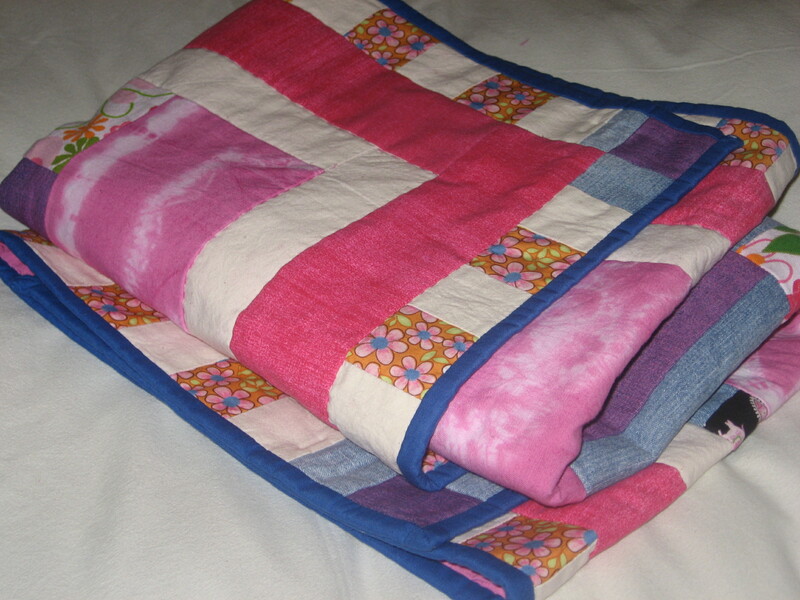 I like cot quilts; they’re little, and therefore much faster to create! Yes, it’s for a girl. 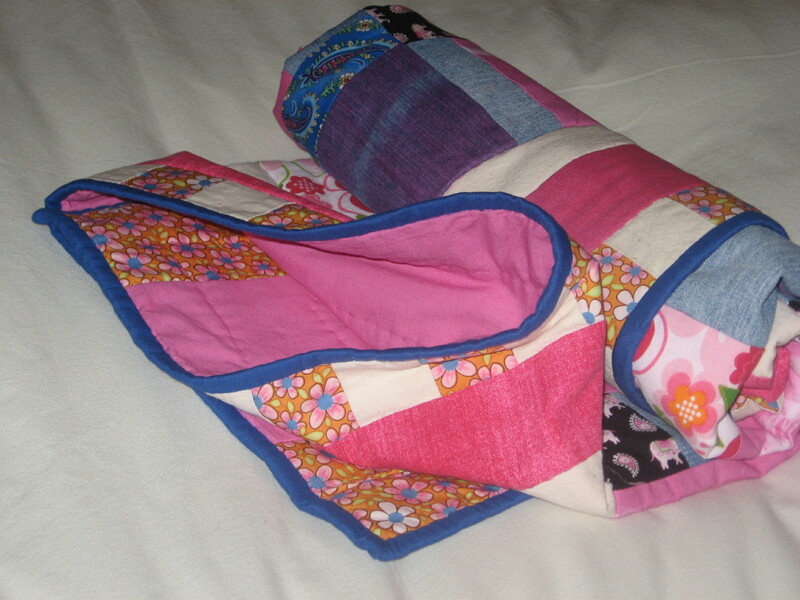 The rest of the fabrics were from my stash, mostly scraps or offcuts from other fabrics. 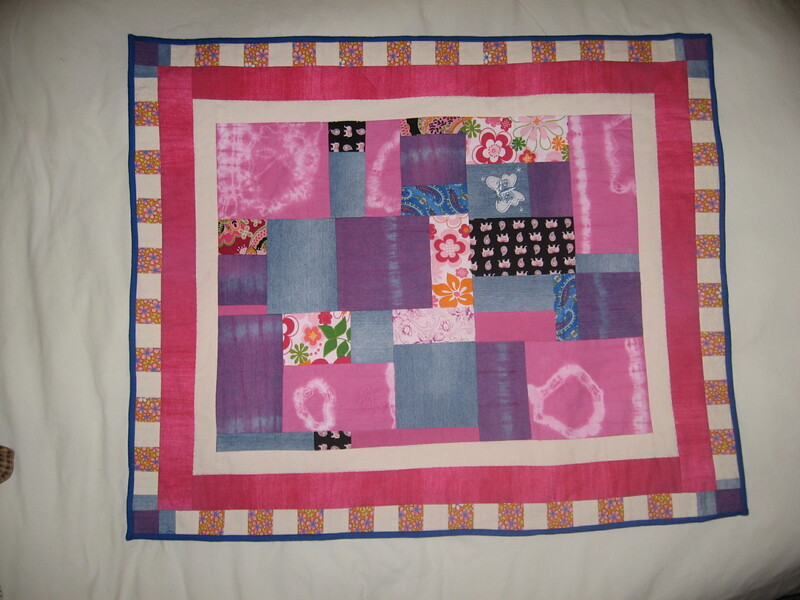 I love the concept of the ‘scrap’ quilt – that being the true origin of patchwork after all! – and I think I will be exploring that concept further in days to come! One bit I really like is that the little girl’s jeans had a butterfly embroidered on one leg which I sort of showcased as a patch; and the linen napkin was embroidered with a flower as well (not so obvious after dying though). My ‘design process’ involved cutting some larger pieces and spreading them out in a rough rectangle, filling in the gaps with other scraps until I liked the general vibe. 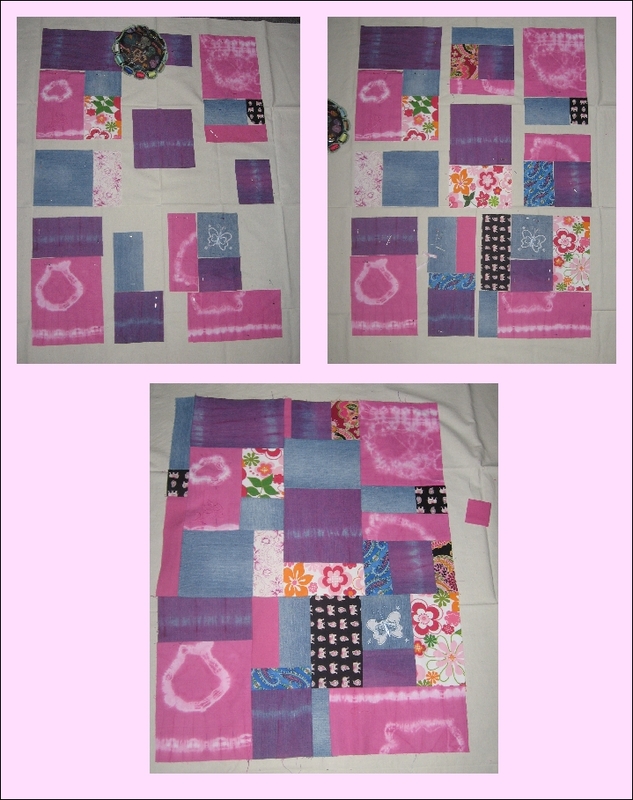 Then, bit by bit I sewed pieces together until I made up 3 blocks, then put those together. I had a dreadful time figuring out what to do with the border; my original idea involved a checkerboard of calico and pale pink, but when I did a test section it just looked really boring. Lucky for me, my Mum offered up some suggestions which eventually led me to the triple border you see before you. 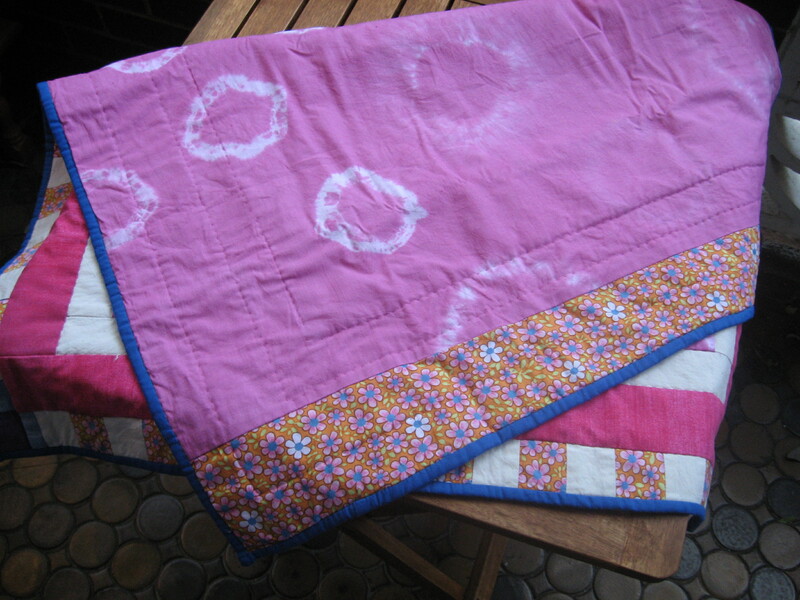 And, which also made the quilt the size I wanted, too! Serendipity. Of course, because it was a randomly-sized quilt, and even though I measured and divided and did maths to get the right number of squares in the border, it still didn’t quite work. Hence the little corner-ey bits, which helpfully used up the last scraps of denim. It was hard to decide what kind of quilting to do. My attempts at machine-quilting have not been wholly successful in the past, and I thought this didn’t need too much more action on it anyway – it’s pretty ‘busy’ as it is. 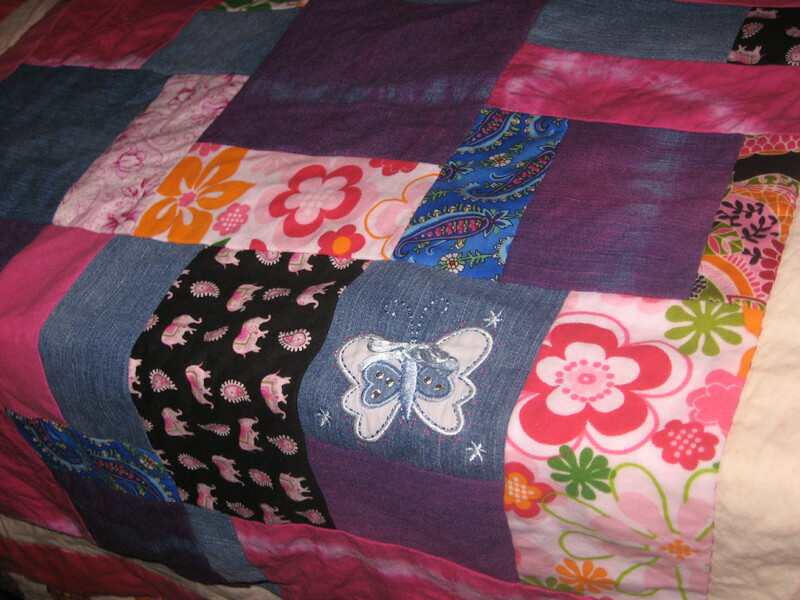 So I ended up doing my first real hand-quilting, around each border, and around the butterfly. No, silly. Silkworms make silk. And do you know how humans get the silk out of silkworms? By BOILING THEM ALIVE. Lovely. Remind me to show you the pictures. I just wanted to say you are amazing! I can’t believe how much work you put into this, it really is gorgeous! We have it on the cot ready for bubba’s forthcoming arrival.